Lucy Wiltshire operates a home for teen girls to get them off the street and provide them with hope for a future. Unfortunately, her major donor, Sinclair Enterprises, has withdrawn their pledge and a heavy threat of closure looms over her dream. She goes to a fundraiser to attempt to talk to the board members who voted against her and it's here she meets Alex Sinclair and her life changes forever with the click of a camera. 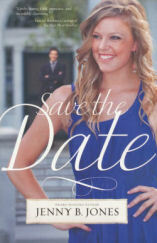 I enjoyed Save the Date. I really liked the dynamic between the couple...Lucy isn't a girl easily swayed by Alex's charms so she ends up being a challenge for him. They banter quite a bit and that's always fun, there is some clever dialogue. They are able to help each other grow in certain ways and face their fears and inadequacies. I had some trouble with the premise. Perhaps I missed it, but if there was any sort of legal work done for this deal, it seems like this would be something that would be really easy to uncover by the paparazzi. But hey I just ignored this and went with it since it is a pretty fun way to tell a love story. It should also be noted that this is definitely for Christians. The characters offer "to drop everything and pray" for each other and there are a couple of significant scenes in churches. While this is not my favorite way to advance a spiritual plot thread, it is common in Christian fiction. All of that aside, the most important thing is that this love story was believable for me. It's a rags to riches story, but in an unconventional way and the romance truly melted my heart. I liked both Alex and Lucy and I wanted their romance to succeed.